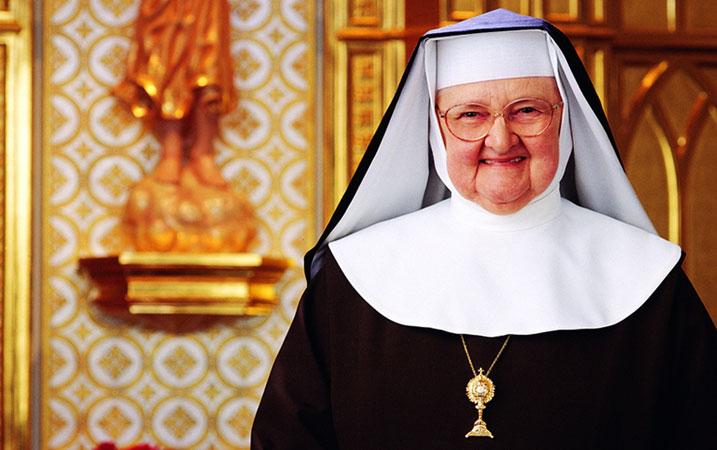 It's About TV: Mother Mary Angelica, R.I.P. From David Sarnoff to William S. Paley, network executives have been known as a tough lot. Whether they're present at the founding or are called in to save the network, they have to be determined, resistant to pressure, unafraid of taking big risks, unfazed by criticism, willing to say what's on their mind regardless of the consequences. They must have nerves of steel, and spines to match. Mother Angelica was all that, and more. It's remarkable, when you think about it: a nun, living in rural Alabama, taking advantage of the burgeoning cable TV revolution to create a media empire. The odds against such an enterprise even getting off the ground, let alone succeeding, might lead one to believe that Mother had just a little help here and there from an Executive who carried a little more clout that the average network suit. Her legacy within the Church is a substantial one: of her often acrimonious run-ins with liberal Church hierarchy, Catholic reporter John Allen Jr. wrote at Crux that she "showed that a woman can stand toe-to-toe with powerful clerics in the Church and give every bit as good as she got." She was a leading advocate of orthodox Catholicism in the United States at a time when such orthodoxy seemed as passe as social conservatism does in the Republican Party today. She gave voice to ideas that were not fashionable and found, not to her surprise, that many people agreed with her. She gave leading Catholic intellectuals an opportunity to communicate to a wider audience than they could have hoped for, and helped start a revolution. She was unafraid to take on bishops, cardinals, and even the pope, and as a result she won the worldwide admiration of many bishops, cardinals, and popes. She undoubtedly took pride in her enemies, on the grounds that a person can be judged based on those who oppose them. This, however, is not a religious blog - it's all about TV. (Where have I heard that before?) And in this context we remember a woman who became the Fulton Sheen of her time, a magnetic presence who captivated her audience with wit and wisdom, with a solid conviction of her beliefs and an innate ability to communicate them to a wide-ranging audience for extended periods of time. Without her television presence, it's unlikely there would have been an EWTN. The story of the network she created is surely an extraordinary one. According to the always-reliable Wikipedia, "After she gave an interview on then-Christian station WCFC (Channel 38) in Chicago, she decided she wanted her own network. 'I walked in, and it was just a little studio, and I remember standing in the doorway and thinking, "It doesn't take much to reach the masses". I just stood there and said to the Lord, "Lord, I've got to have one of these."" Back then, in 1981, the network programmed four hours a day. By 1988 it was a 24-hour cable channel; in the early '90s, a radio network followed. As a network executive, she proved to be a crafty strategist, able to fend off hostile takeover attempts by enraged Church establishment figures. By having her network cover the national bishops' conference, she demonstrated how the medium can bring transparency to an institution badly in need of it. As Allen writes, "She and EWTN relativized the power of the hierarchy in America, not by attacking it, but simply by showing they didn’t need it to succeed," and if that isn't in the great tradition of media moguls, not only the Sarnoffs and Paleys but the Hearsts and Sulzbergers as well, then I don't know what is. By taking risks, by scoffing at the scoffers and putting her trust instead in that Network Executive in the sky, she built a global network that reached 250 million homes in 140 countries and territories. Not bad for a nun who probably never aspired to such a role. When I went through my conversion to Catholicism many years ago, EWTN provided a vital component, and Mother Angelica's enthusiasm soon became my own. Through the network, I was introduced to a world that I likely would not have found had I stuck to more conventional sources of information. Ultimately, one of the tests of a great person's legacy is how well the institution he or she built withstands that person's absence. I don't think it is an exaggeration to say that EWTN has lost much of its potency over the last two decades, first in a struggle over control of the network, then because of Mother Angelica's debilitating series of strokes. Today's programming fails to live to to the intellectual standard of the past, no longer providing the challenging, thought-provoking arguments it once did. Its news programming lacks gravitas, and its entertainment programs often lack quality. I, who once watched it daily, haven't watched it in many years. This article at the Catholic blog OnePeterFive accurately points out the many, many shortcomings of the network today, and how it has essentially been swallowed up by the establishment. One wonders what Mother Angelica herself thought of the present-day version of her network, of what her vision had become. In the end, though, that may be the difference between a visionary and one who simply accomplishes great things, for the latter is often someone who sees an opportunity that others fail to appreciate and acts on it, perhaps better than someone else might have, perhaps not. A visionary, on the other hand, frequently has a singular gift for seeing things that other people can't, and to the extent that their legacy suffers, it's because their successors are unable to see that vision. As in athletics, some things can be taught, but other things are simply gifts with which one is born. The legacies of television's pioneers often suffer because their successors lacked that vision, a vision so great, so personal perhaps, that nobody else was capable of sharing in it. I doubt that anyone else could fully have appreciated the calling that Mother Angelica had, that vision that she received and had the courage - and faith - to act upon. She died this past Sunday, Easter Sunday, at the age of 92, a date that most people thought appropriate. John Allen ended his obituary paraphrasing from Hamlet, "Take her for all in all, we shall not look upon her like again." I think that about says it. Wonderful tribute, Mitchell. I've watched Mother Angelica many times over the years and found her both tough and compassionate, with a very smart sense of humor. "Some theologians say there is no hell," I remember her saying, "Well....when you get down there an you meet those theologians..."
Isn't that so typical of her? Thanks for the kind words, David!